Most of us know the attractions Rajasthan is famous for, the most prominent amongst them being forts, palaces, desert safaris and folk culture. These draw tourists in large numbers and it’s these very factors that have made Rajasthan one of the most popular tourist destinations in the country. However, this enormous state is also home to several lakes, those delightful water bodies which are great avenues of entertainment, and enhance the aesthetic appearance of a place. Although most of the lakes found here are man-made, there are also a few natural bodies of water scattered all over the state. 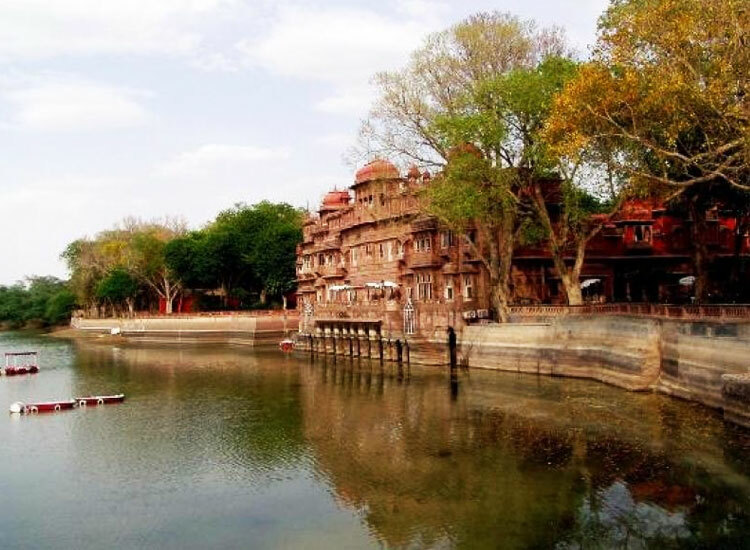 This blog lets you know the various lakes in Rajasthan which you can visit during your visit there. Rudyard Kipling is known to have mentioned Lake Pichola in his Letters of Marque (1899), “If the Venetian owned the Pichola Lake, he might say with justice, “see it and die’’. 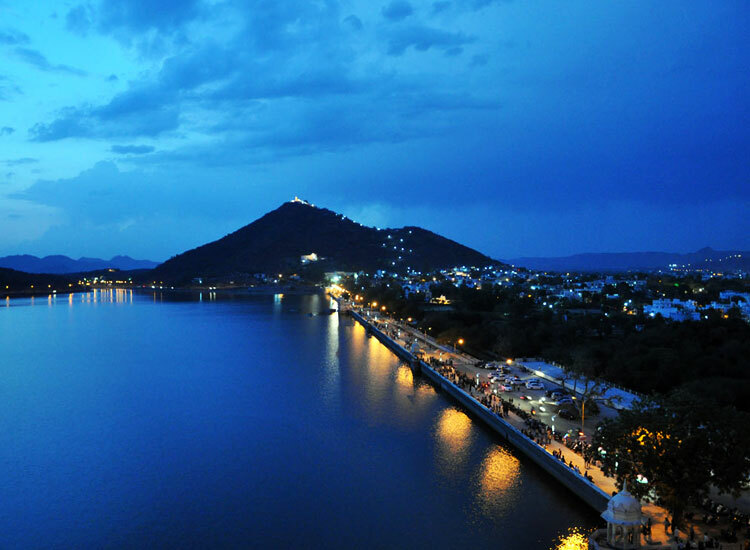 Located in the heart of the city, it’s one of the oldest and largest lakes of Udaipur. The lake extends to 3 miles in length, 2 miles in width and about 30ft in depth. This magnificent lake was built by Pichhu Banjara during the ruling period of Maharana Lakha in 1362. The lake is surrounded by palaces, bathing ghats, temples and elevated hills on all sides. It also provides a glimpse of the Eklinggarh Fort. Several small islands accompany the calm waters of this lake. The floating wonder, Lake Palace, is located on the Jag Island of its waters. A memorable experience here, however, is a boat ride. The views surrounding you, along with the cool breeze brushing across your face, tends to have a soothing effect on your mind. 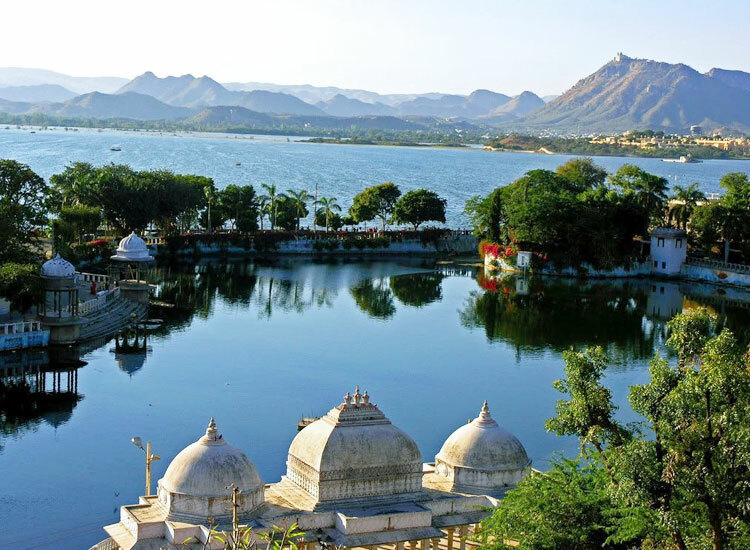 Fateh Sagar Lake, constructed by Maharana Jai Singh in 1678 AD, is a beautiful lake surrounded by hills and windows. It lies to the north of Lake Pichola, and was reconstructed by Maharana Fateh Singh (1884-1930 AD) after the earthen bund (dam) was washed away in the floods. This lake is considered to be one of the most popular lakes in Rajasthan. It consists of three small islands, with the largest amongst them being thee beautiful Nehru Island, which is extremely popular with the tourists. The second island has a public park and a magnificent water-jet fountain, while the third is home to the Udaipur Solar Observatory. All the islands can be visited by motorboats. Its interesting to note that the blue surface of the lake with the green mountains in the background has led to Udaipur as India’s “Second Kashmir”. 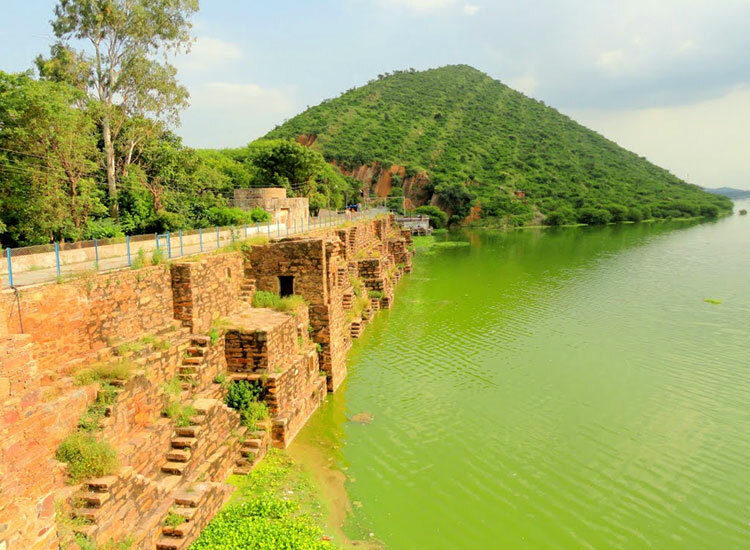 Ana Sagar Lake is an artificial lake, built by Arnoraj Chauhan who was the grandfather of Prithvi Raj Chauhan. As he was also known as Anjani, this lake has been named after him. It offers an array of recreational activities for the tourists. There is an island in the centre of the lake which is accessible by boat. The lake is surrounded by Daulat Bagh gardens which was built by Jehangir. 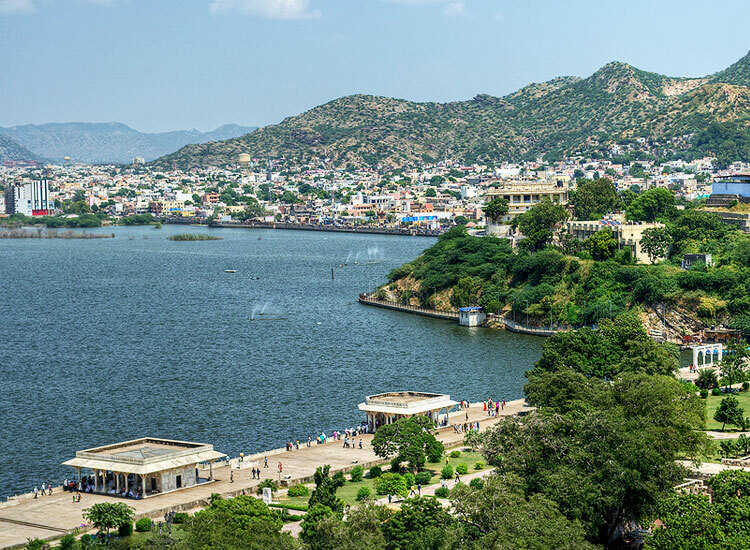 This artificial lake, spread over 13km, is situated in the Ajmer city of Rajasthan. An island can be found in the centre of the lake. Tourists can hire boats or water scooters from the east side of Daulat Bagh to easily reach the island. Every year during the summer, the lake gets dry. A circuit house, located on a hill in close proximity to the lake, served as the British residency till last year. The never ending skylines, the all-pervading silence occasionally broken by the call of the curlew and the clear skies above, the Sambhar Salt Lake is best for those wanting to get lost in the surroundings. It’s the biggest inland salt lake in India, and even finds a mention in the legendary epic, “Mahabharata”. This lake has also been included in the list of Ramsar sites in India. Flamingos, along with other birds, have a massive presence here, and fly in all the way from Northern Asia. One should visit this place to admire its topography as well as the abundance of sightseeing opportunities. 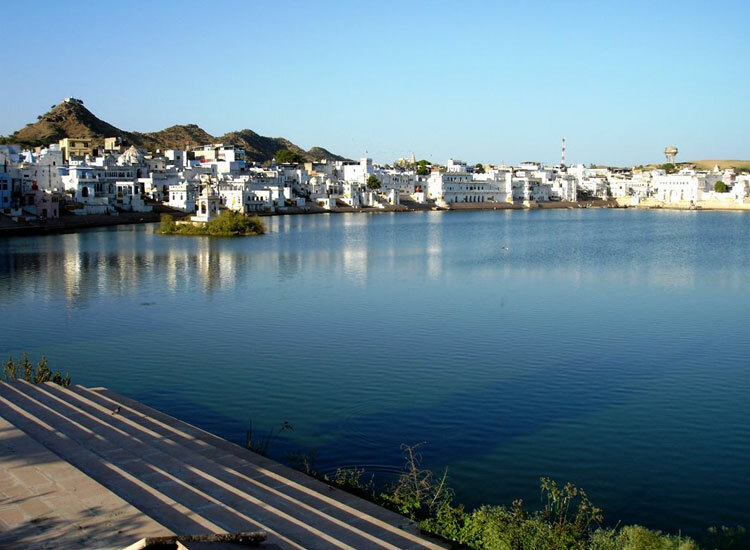 The creation of Pushkar Lake is associated with a popular legend, according to which, a lotus fell from the hands of Lord Brahma, the god of creation. The spot where the lotus fell led to the creation of the lake. Naturally therefore, it’s considered to be a sacred lake. It’s believed that bathing in the waters of the lake on Kartik Poornima (during the Pushkar Fair), eradicates all sins and cures all kinds of skin diseases. The lake has 52 bathing ghats (steps leading into the water) and the water around each is said to possess medicinal powers. One can observe the rituals that are carried out on these ghats by the sadhus. People can be seeing taking a dip in its sacred waters during the mornings and evenings. It’s also a lovely place to hang out and while your time away in peace. 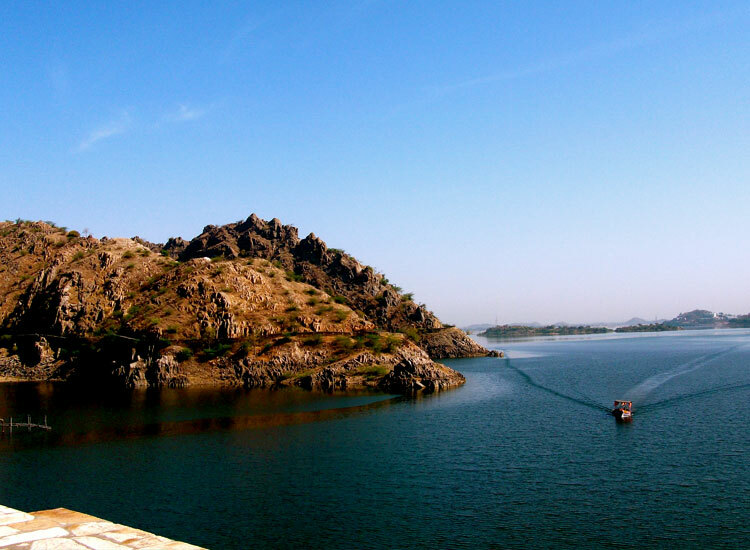 Dhebhar Lake, also known as Jaisamand Lake, is India’s second largest artificial lake. Located at a distance of almost 48km from the city of Udaipur, it was built by Maharana Jai Singh in 1685 during the construction of a dam on the Gomti River. This lake, counted amongst the beautiful lakes in Rajasthan, covers an area of 36sq. km and stretches to a length of 14km with a width of 9km. The huge damn constructed on this lake also houses a centrally located Shiva Temple. Six intricately carved marble cenotaphs can be found on its embankment. Out of the seven islands found here, one is inhabited by Bhil Minas. Tourists can enjoy a lovely boat ride in its serene waters. 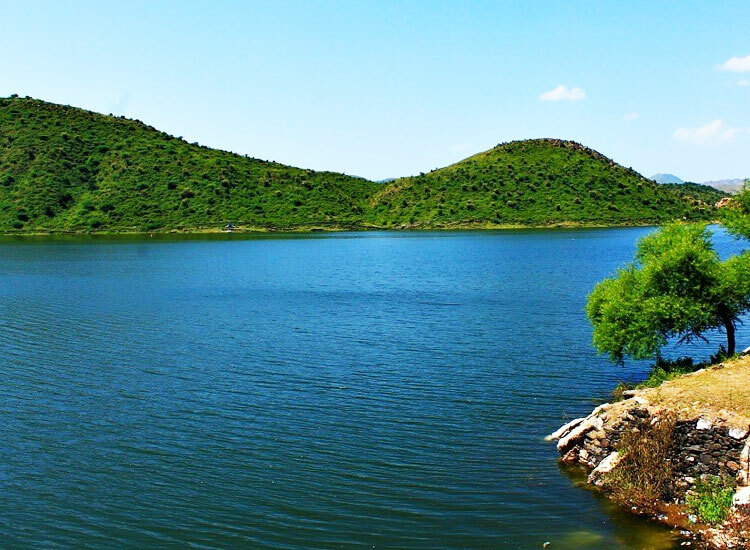 Kaylana Lake, located at a distance of 8km west of Jodhpur City, is an artificial water body. Constructed by Pratap Singh, the then prime minister of Jodhpur in 1872 on the site of two former palace and gardens, its construction is said to have required the demolition of old palaces and gardens. The lake is surrounded by a garden called Pratap Sagar, where one can view various species of birds. However, one should definitely visit during the evenings to view the lovely sunsets. During this time, the sky looks like a portrait splashed with colours. This area once served as a hunting place for royal members. 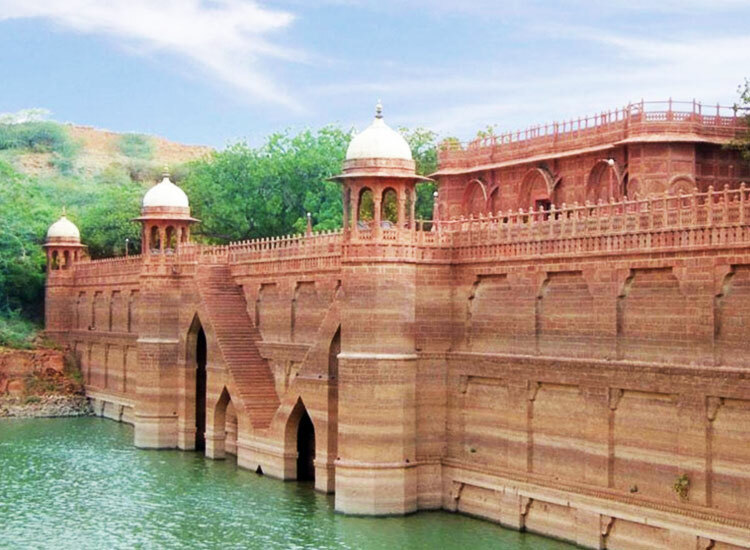 Balsamand Lake was built in 1159 AD by the Gurjara-Pratihara rulers to serve as the source of drinking water for the town of Mandore. Located about 5km away from the main city of Jodhpur, Rajasthan, this artificial reservoir has a depth of 15m, length of 1km and breadth of 50m. Surrounded by beautiful landscape and tranquil waters, it’s a great spot for enjoying a picnic and escaping from the commotion of city life. Adjoining the lake today is the Balsamand Lake & Palace. It was once the summer residence of the Maharajas of Jodhpur, but stands as a heritage hotel today. 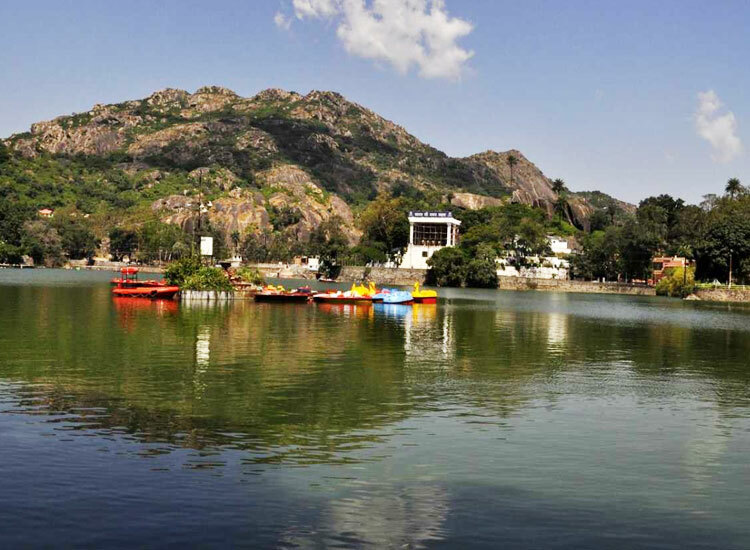 Lake Foy Sagar, an artificial man-made lake located to the west of Ajmer City, was constructed by the English architect, Mr. Foy in 1892 AD. It was subsequently named after him. It was built for the sole purpose of eliminating scarcity of water in Ajmer during times of drought. It now serves as a famous picnic spot. 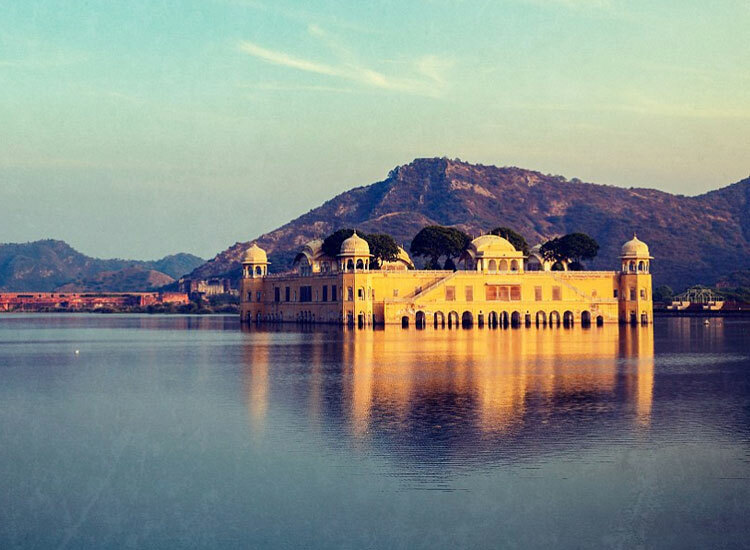 Man Sagar Lake, an artificial lake situated in Jaipur, the capital of Rajasthan, is famous for its spectacular beauty along with the fabulous Jal Mahal Palace. 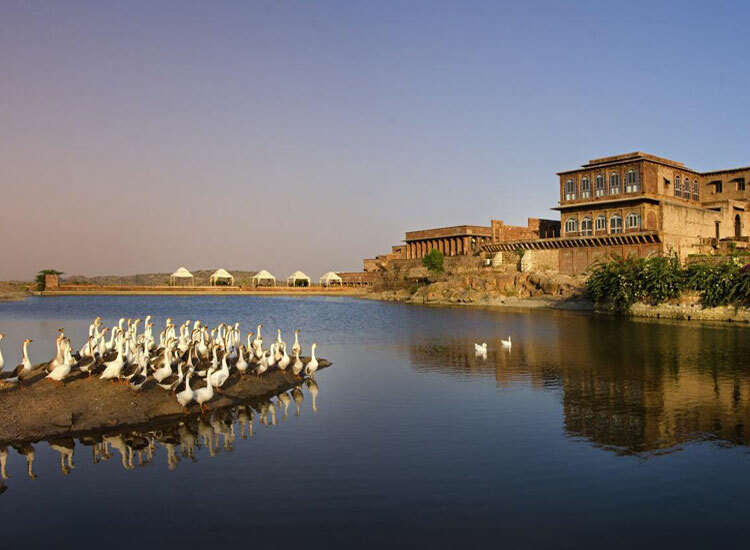 It’s counted amongst the most famous lakes in Rajasthan. This lake was constructed by Raja Man Singh I, the then ruler of Ajmer, around 1610 AD, by damming the Darbhawati River. The lake is surrounded by hills on western, northern and eastern sides. It has undergone a rapid transformation in the last 5 years. Reduced to a polluted sewage once upon a time, today its freshwaters attract migratory birds. For most people, it’s the perfect escape from the hustle and bustle of city life. 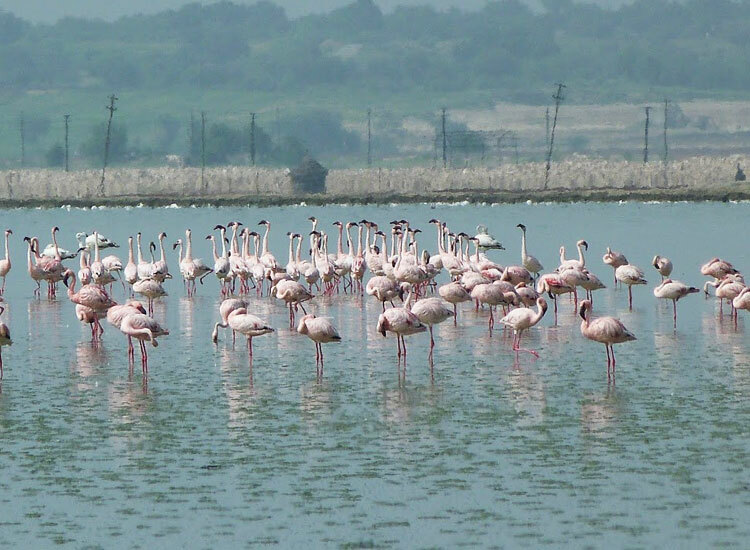 Along the route to Pichola Lake lies another famous destination, the Doodh Talai Lake. The lake sits comfortably between several hillocks which themselves are major tourist attractions. The Deen Dayal Upadhyay Park and the Manikya Lal Verma Garden are part of the Doodh Talai Lake Garden. Among these, the Manikya Lal Verma Garden provides an incredible view of Doodh Talai Lake. Counted among the recent attractions, it was built in 1995 by the Nagar Parishad (Municipal Council) of Udaipur. One can reach the top here by driving one’s way to the top or climbing the steps. 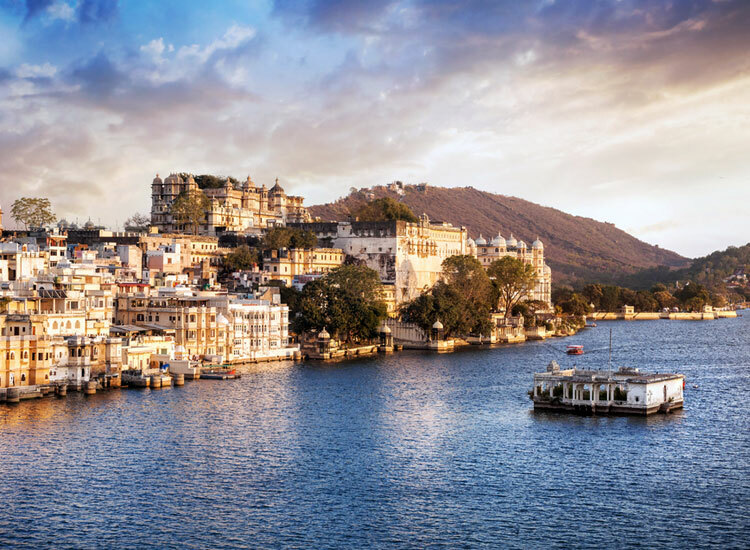 The city of Udaipur is home to five major lakes, one of which is the Udai Sagar Lake. This wonderful lake, located about 13km east of the city, was created during the reign of Maharana Udai Singh. The Maharana, in 1559, commissioned the construction of a damn on Berach River to meet the demands of water in his kingdom. It’s believed that the armies of Maharana Raj Singh defeated and conquered the army of Emperor Aurangzeb near Udai Sagar Lake. Today however, it’s visited by both locals and tourists, all eager to absorb its beauty and have a good time. Legend has it that this lake was extracted by God using only his nails or “nakh”, and for this reason, is considered holy by many Hindus. It’s an excellent picnic spot and offers magnificent views of the surroundings. It’s the perfect place to enjoy boating, too. A temple, dedicated to the local deity, Raghunathji, is located by the lake. Ramgarh is famous for its beautiful artificial lake, the Ramgah Lake. 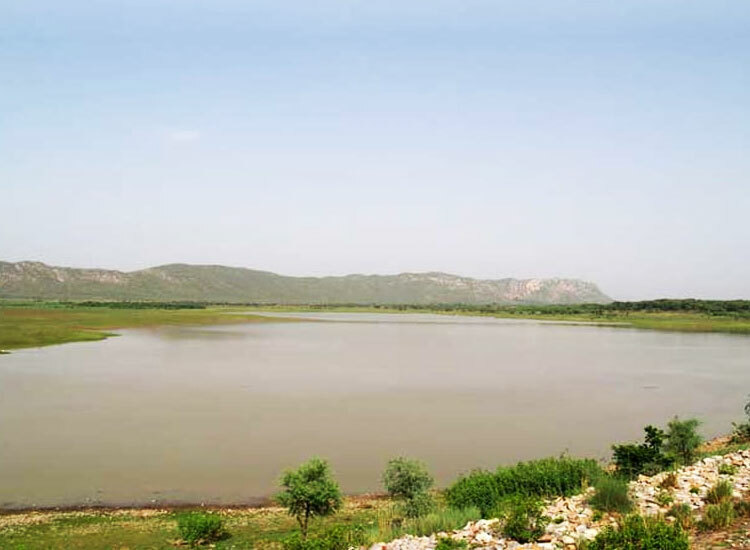 Located at a distance of approximately 35km from Jaipur City, the lake covers a distance of almost 16sq. km, its beauty is best witnessed during the monsoon. This lake is a manmade body created by forming an embankment on the forested hills, and attracts a significant amount of tourists every year. Bird watchers also visit this lake frequently to watch the flocks of birds, especially migratory birds, which visit this lake. 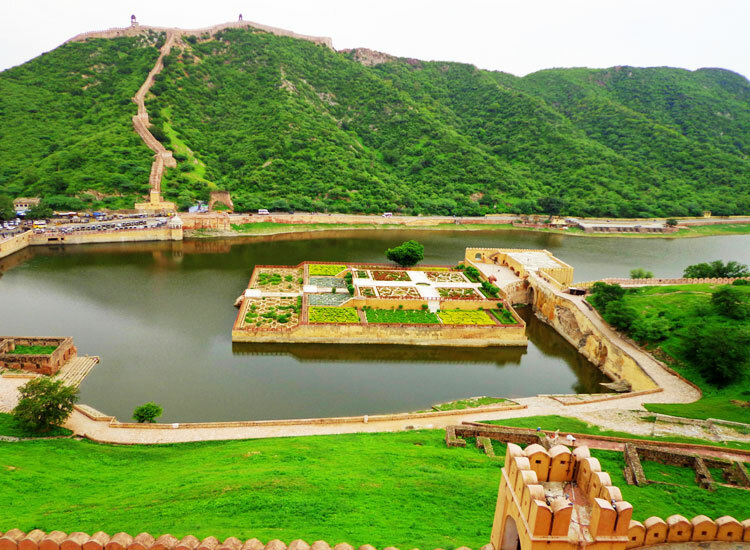 Maota Lake, located about 11km from the centre of Jaipur, lies at the base of Amber Fort. It contains an island in the centre called Kesar Kyari Bagh, whose saffron garden is the main highlight. Its plants are said to have been planted by a Maharaja in the 15th century. On the northern side of the lake is situated the Dil-Aaram Bagh. The lake collects rainwater flowing down from the nearby hills. In earlier days, it served as the main source of water for the Amber Fort and the common people. Lake Badi is situated in the city of Udaipur, at a distance of almost 10km from Badi village. 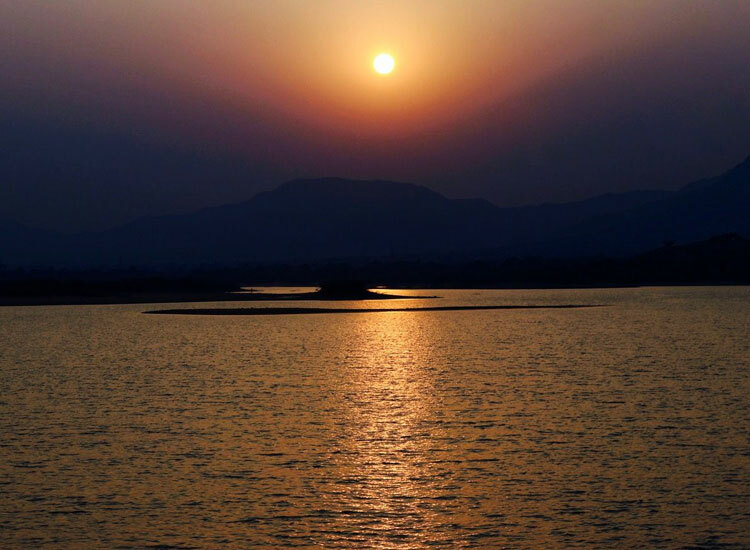 Also known as Jiyan Sagar, it’s named after Jana Devi, the mother of Maharana Raj Singh. It was built in 1684 AD, to counter the devastating effects of a famine. Lake Badi is graced by three artistic “chhatris” (kiosks or pavilions). One can spend time at leisure here, as the lake provides a serene and calm atmosphere to the visitors. Counted among the beautiful lakes in Rajasthan is the Gajner Lake. Its main attraction is the looming towers that is located at its entrance. This lake, which once served as the summer holiday home of the royals, is now part of a luxury hotel. Boating can be enjoyed at the lake on solar powered boats. With the arrival of winter months, the lake becomes home to more than a hundred species of migratory birds, one of which is the Imperial Sand Grouse.